According to a recent Gallup study, 51% of employees aren’t engaged at work. Meaning they just do what they have to do to get through the day, but don’t really have dreams for advancement. Another 16% are “actively disengaged,” meaning they complain all the time and bring the entire mood of the workplace down. That’s about 2/3 of the workforce who don’t really like their jobs. But these individuals don’t quit. They keep working. Why? Giving your resignation to your boss is never an easy thing to do. You may not get along with your boss or you may dislike your job, but it’s still important to quit your job professionally and with tact. If you’re preparing to resign from a job, plan it out and handle it as carefully as you would any other business decision. Don’t burn your bridges, because you never know when a former employer will come in handy for as an ever-important reference. If you are absolutely certain that it’s time for you to resign from your job, here are some tips to make quitting a little easier and more professional. Chances are, your employee handbook spells out how much notice you should give. If it does, then abide by it or offer at least two weeks of notice. If you absolutely cannot stay a minute longer, here are some acceptable reasons for not giving notice. Sometimes, your boss might ask you to stay a little longer than two weeks. You have no obligation to stay, but the decision is ultimately up to you. Offer to help your previous employer by training someone during your two weeks or answering questions that may be emailed to you in the coming weeks. Write a formal resignation letter. Be professional in the letter, submit it, and tell your immediate supervisors about your decision. Need tips on how to write a resignation letter? Check out these tips. Emphasize the positive things you gained at the company, but be firm about your decision to leave. Offer to help during the transition, and try to keep negativity out of the letter. You may have great reasons for leaving, but there’s no point in hashing it out – you’re leaving anyway, so make sure you leave on good terms. Always ask for a written letter of recommendation for future employers. Before leaving, get your employee benefits, unused vacation, sick pay, and retirement funds all in order. Some great tips about employee benefits are available here. Don’t take what doesn’t belong to you. Sure, this may seem like common sense, but even your email list might fall under this category. Before you leave, return important documents, property like cell phones, keys, and anything else that you didn’t personally buy. It’s easy to check out that final week of work, but keep doing your best. Being professional up to the very end will pay off. Leaving a job and turning in a resignation is a stressful transition. Take time to decompress and renew your spirit to make sure you have the right state of mind to hit the ground running at your new job. Have you ever resigned from your job? How did you handle it? Share with us in the comments section below. If this Super Bowl commercial was shocking to you, you’re not the only one who felt that way. While funny, it does bring up an important point about how to quit a job – the wrong way. Not only did she quit her job, she quit in front of millions of people on national television! There are many ways to quit your job with class. Here are some tips on how to quit your job without burning any bridges, embarrassing yourself, or demeaning your employer. “You may work for that person again,” says Lynne Allen, a career coach who formerly worked in recruiting and staffing at Colgate-Palmolive and Time Inc. Your behavior as you leave a job shapes your colleague’s lasting impression of you. Before you make that final walk out the door, remember whatever you say and do is how you will be remembered. That’s a great reason to think about how you’re going to give your boss the news that you’re quitting. Just remember to not burn any bridges along the way because you never know where they can lead. It’s always important to stay classy. Giving at least a two weeks’ notice is a polite thing to do. It allows your boss to be on the lookout for someone to fill your shoes, and if your replacement is hired within your final two weeks, your boss may ask you to help train them. 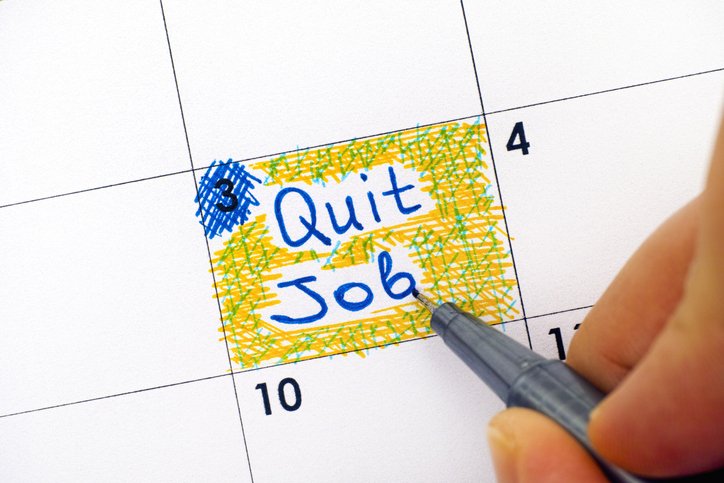 When the time comes to quit a job, make it one of your professional goals to quit with class. Quitting can be tough not only for you but for the person receiving the news. So, be sure to schedule a meeting with your boss to give your two weeks’ notice. This will give you time to talk face-to-face about the reasons you’re quitting. Don’t ever just tell your boss to shove it! 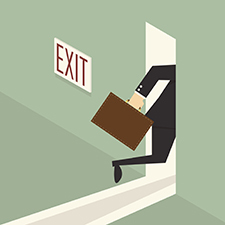 If you’ve been contemplating leaving your job, but haven’t given your two weeks’ notice yet, you need to be preparing to leave. Clean up your work space and make sure your work is organized. Depending on your boss’ reaction after you give them your two weeks’ notice, they may ask you to leave immediately, so you need to be ready for that response also. 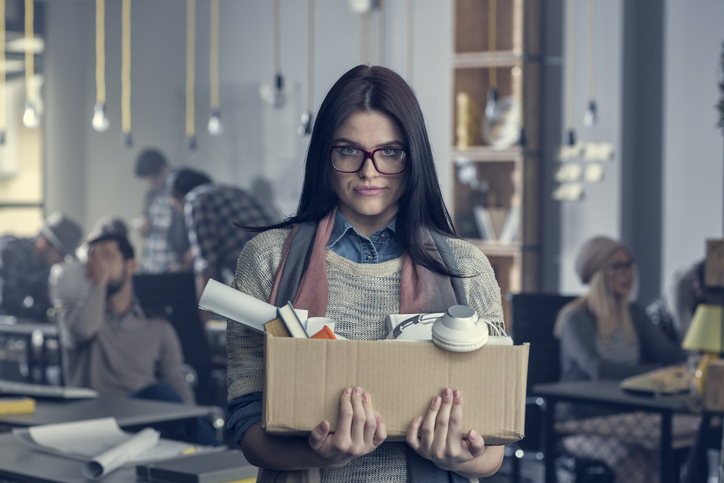 Changing jobs can be exciting, rewarding, and a great step for your career, but breaking up with your employer isn’t something to be taken lightly. What factors do you consider before making a job hop? Share them in the comments section below. Is a Two-Week Notice Still Necessary? I recently read an article on MSNBC titled Take this job and shove it! The article talks about how employees who survived recent company layoffs aren’t following traditional job protocol when they leave their company. Employees are now leaving without giving their employers a two-week notice, and some are even going to work for competitors – despite noncompete agreements they signed with their previous employer. Company layoffs and benefit cuts can leave surviving employees feeling angry, scared, and nervous that they might be next on the chopping block. In this economy, employers can’t promise their employees that no more cuts will be made. Even if employers give a sense of security to their workers, the trust between the company and its employees is already broken, resulting in many people searching out other job opportunities. Often, when the trust is broken between employers and their employees, employees no longer feel obligated to give a two-week notice. The need to feel in control of the future often overrides feelings of loyalty and common workplace courtesy toward employers. But, is it OK to leave your current job without giving the courtesy of a two-week notice? Leaving your place of employment for better opportunities, a more secure job, or simply because you don’t like how they handled things when layoffs came around is not necessarily a bad thing. But, leaving without giving your employers adequate notice is not good for your professional image. So, if you’re looking for different employment, don’t leave on a sour note or burn bridges with your employer. No matter what the situation, make sure to give ample time for the company to make alternate arrangements and offer your help to make sure the transition is an easy one. Leave with your professional image intact, and you will not only feel better in the long run, but you’ll leave the door open for any possibility your career leads you to.